Gaetano Mosca (April 1, 1858 Palermo, Italy – November 8, 1941 Rome, Italy) was an Italian political philosopher, political scientist, journalist and public servant. He is credited with developing the Theory of Elitism and the doctrine of the Political Class and is one of the three members constituting the Italian School of Elitists together with Vilfredo Pareto and Robert Michels. Mosca is most famous for his works on political theory, Sulla teorica dei governi e sul governo parlamentare (Theory of Governments and Parliamentary Government), published in 1884; Elementi di scienza politica (The Ruling Class), published in 1896; and Storia delle dottrine politiche (History of Political Doctrines), published in 1936. His enduring contribution to political science is the observation that all but the most primitive societies are ruled in fact, if not in theory, by a numerical minority, or elite, which he termed the “political class.” Mosca defined modern elites in terms of their superior organizational skills, which enabled them to gain political power in modern bureaucratic society. He advocated a mixed system of government, partly autocratic, partly liberal, in which “the aristocratic tendency is tempered by a gradual but continuous renewal of the ruling class” by the addition of members of lower social and economic classes who have the desire and the ability to rule. Gaetano Mosca was born April 1, 1858 in Palerma, Sicily, which was part of the Kingdom of the Two Sicilies before Italian unification in 1861. Mosca earned a degree in law from the University of Palermo in 1881, and taught constitutional law there from 1885–1888. In 1887, he moved to Rome and took a position as editor of proceedings of the Chamber of Deputies of Italy. Mosca taught at the University of Rome (1888–96) and became chair of constitutional law at the University of Turin in 1896. He held this position until 1924, when he settled permanently in Rome to occupy the chair of public law at the University of Rome. In 1909, Mosca was elected to the Chamber of Deputies of Italy, in which he served until 1919. During this time, he served as Under-secretary for the Colonies from 1914 until 1916. In 1919, Mosca was nominated life senator of the Kingdom of Italy by King Victor Emmanuel III. 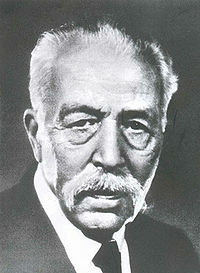 He served actively in this capacity until 1926; during the Fascist dictatorship, Mosca retired to teach and research. His last speech in the Senate was an attack on Benito Mussolini. Mosca died in Rome on November 8, 1941. Mosca is most famous for his works on political theory, Sulla teorica dei governi e sul governo parlamentare (Theory of Governments and Parliamentary Government), published in 1884; Elementi di scienza politica (The Ruling Class), published in 1896; and Storia delle dottrine politiche (History of Political Doctrines), published in 1936. When World War I broke out, in spite of the activities of political revolutionaries, the people supported their national governments. After the war, when the victorious powers were unable to sustain world order, World War II followed, resulting in the development of weapons which threatened to destroy the entire world. In the aftermath of these shocking events, three types of political philosophy developed. Political pragmatism sought to maintain order through managed capitalism, welfare, and rule of law, while rejecting tyranny. Existentialism appealed to the conscience and the inner self, and reaffirmed religious values. Marxism and other revolutionary thought systems sought to overturn the existing order and replace it with a materialistic structure. Many pragmatists criticized the existing order, but attempted to work within it to bring about social and political improvements. Others examined the established order as it was, without expecting to improve it. Among these were the Italians Vilfredo Pareto, and Gaetano Mosca, who did not seek to bring about change, but to theorize about what occurred in society. Pareto's Mind and Society (1916) classified political myths, and concluded that society will always be manipulated by elites, with power merely shifting from one group of rulers to another. Mosca, in The Ruling Class (1939), analyzed the ways in which political myths are exploited. He concluded that power is always in the hands of elites, and that the least bad government occurs when abuse of power is controlled by the rule of law. Although he was aware of its limitations, Mosca appreciated the constitutionalism of the nineteenth century, which attempted to regulate government with a written political contract rather than according to the will of individual rulers. He argued that it was impossible to develop a complete theory to explain history, because events are shaped by competing and interacting interests and their outcome is unpredictable. Only one principle was certain: that there would always be a struggle for predominance. The American philosopher and critic James Burnham, who also analyzed shifts of power, propounded a theory of bureaucratic revolution in The Managerial Revolution (1941), in which the rulers of the new society, the class with power and privilege, would be the bureaucratic managers of “super states,” rather than kings or military leaders. In The Machiavellians, Defenders of Freedom (1943), he described Mosca as a modern Machiavellian. Gaetano Mosca's enduring contribution to political science is the observation that all but the most primitive societies are ruled in fact, if not in theory, by a numerical minority. He named this minority the political class. Although his theory is correctly characterized as elitist, its basis is far different from The Power Elite described by, for example, C. Wright Mills. Unlike Mills and later sociologists, Mosca aimed to develop a universal theory of political society, and his more general theory of the Political Class reflects this aim. Mosca defined modern elites in terms of their superior organizational skills, which enabled them to gain political power in modern bureaucratic society. In Teorica (Sulla teorica dei governi e sul governo parlamentare, 1884; “Theory of Governments and Parliamentary Government”), Elementi di scienza politica (1896; The Ruling Class), and other writings, he asserted that, contrary to theories of majority rule, societies are necessarily governed by minorities. The minority might be a military, priestly, or hereditary oligarchy, or an aristocracy of wealth or of merit. The political philosophy of a society was insignificant, except perhaps in determining the type of elite that rose to power. Mosca regarded concepts such as “the will of God,” “the will of the people,” “the sovereign will of the state,” and “the dictatorship of the proletariat” as political myths. Mosca's theory was more liberal than the elitist theory of, for example, Pareto. In Mosca's conception, elites were not hereditary in nature, and people from any class of society could theoretically become an "elite." He also adhered to the concept of "the circulation of elites," a dialectical theory that elites were in constant competition with each other, with one elite group replacing another repeatedly over time. Though he was sometimes described as “Machiavellian,” Mosca considered most of Machiavelli's political ideas impractical. He condemned Nazi racist elitism, and Marxism, which he believed was an expression of Karl Marx’s personal hatred for the upper class. He did not advocate democracy, regarding “the extension of the suffrage to the most uncultured strata of the population” as a serious threat to liberal institutions. Mosca promoted a mixed system of government, partly autocratic, partly liberal, in which “the aristocratic tendency is tempered by a gradual but continuous renewal of the ruling class” by the addition of members of lower social and economic classes who have the desire and the ability to rule. Lottieri, Carlo. 1994. "Un élitisme technocratique et libéral. L’autorité et l’État selon Mosca" in L’Année Sociologique. This article is also published in: Raymond Boudon - Mohamed Cherkaoui - Jeffrey C. Alexander (eds.) 1997. The Classical Tradition in Sociology. The European Tradition, vol.II (The Emergence of European Sociology: II - The Classical Tradition [1880-1920]). London: Sage Publications. This page was last modified on 17 May 2017, at 16:47.